An important new study on Climate Change was released last week by multiple agencies of the Federal Government. The study concludes, again, that the world’s temperatures are rising and that human activity is a significant cause. So, did President Donald Trump embrace the science? The newly released study? “I don’t believe it.” was all he said. He placed his uninformed opinion above the competent researchers that produced the report. This nonsense only happens on the Right, right? Wrong. Here in Washington State, environmental activists are doing the same thing. Two weeks ago, an independent and thorough study was released that shows building a proposed methanol plant in Kalama, Washington will reduce Global Greenhouse Gases by as much as is produced by 89% of all private cars on Washington State Roads. 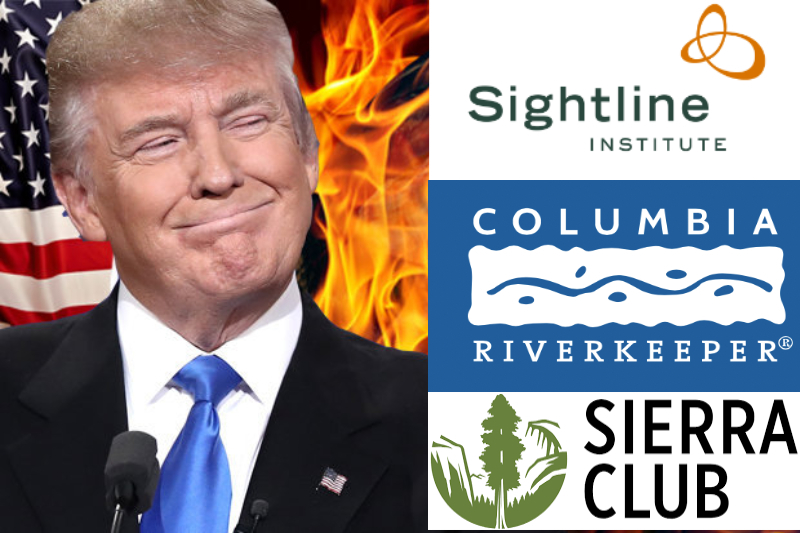 The response from The Sightline Institute, Sierra Club Washington and The Columbia River keepers? Wow. We on the Left can be as daft as the Right. In September 2016, the Draft Environmental Impact Statement was released for a Methanol Production Plant proposed to be built in Kalama. The report made claims that building the plant would have net-positive effects on Global Greenhouse Gases (GHG). Specifically, that by building this plant & shipping methanol to China, that methanol would replace coal in Chinese production processes, resulting in a significant reduction of GHG. Or said more succinctly, using methanol for producing products in China is significantly cleaner than the coal that China currently uses. Activists, however, were not satisfied that the Draft Environmental Impact Statement provided enough research into the overall affects of building the plant. Specifically, opponents, including Sightline Institute and Columbia River Keepers, wanted the State to consider not only the impacts of building the plant within Washington State, they wanted a more thorough study on both the upstream (the GHG that is produced in fracking the natural gas that the Kalama Plant would use) and the downstream (the GHG produced in transporting and burning the methanol in China). Fair enough. I agree with them! We need to understand the entire lifecycle of the projects we build. To that end, the Shoreline Hearings Board put the project permits on hold, and in May of this year, Superior Court Judge Stephen Warning (that name!) ordered exactly that, saying that the environmental review was inadequate & that a full lifecycle analysis had to be done. So what happened? Well…as the Hearings Board, the Judge (Warning! ), and environmentalists asked, a study WAS done. And not a small study, but a comprehensive cradle-to-grave lifecycle analysis of the entire project. In other words, the opponents got exactly what they asked for…and guess what? The study answered and refuted not some, but most of their concerns. The study concluded not only that building the plant would reduce the Global Greenhouse Gases by a little…it would reduce them by a lot! Building the methanol plant at Kalama, according to the commissioned study, will reduce GHG by 11.5 million metric tons per year. That’s just a number…so how much is 11.5 million metric tons? It’s the equivalent of removing 89% of all privately owned cars from Washington State Roads. Think how much work we do to try to improve transportation…and then realize that in one act, we could remove 89% of the negative impact of those cars. Now. Environmentalists Are Satisfied! Right? Right? The critics raised serious and important questions that needed to be answered. And they won! They forced the independent study! And the most important questions they were asking have now been answered. You’d expect them to be satisfied, to move from being skeptics to supporters, right? After all, this project represents the single-largest reduction of GHG that Washington State will have ever undertaken. That’s a win! Right? In my 25 years in political activism, I’ve learned one important truth: activists are rarely happy. Many are so identified with their opposition to a thing that they can’t recognize when they’ve won an important battle. And that’s what has happened here. Sightline, The Sierra Club and the Columbia River Keepers won an important battle. And they’re still not happy. Trump Wants Coal. Environmentalists Want Coal Too? Trump has been busy trying to prop-up and revive the coal industry. And here again, we find a parallel with Sightline, Sierra Club and Columbia River Keepers. These enviros are screaming “Fracked Gas!” as though they are telling you the whole story. They are not. Their complaints are short-sighted and disingenuous. Why? Because “fracked gas!” is only one side of the equation. The other side? Dirtier Coal. By opposing the plant in Kalama, these environmentalists are propping up the coal industry in China. They are arguing that instead of taking this opportunity to displace coal, we should maintain the status quo. Do nothing. Allow China to simply proceed as normal. In other words, burn more and more coal. The methanol produced in Kalama will replace a much dirtier fuel. So while we can all agree that fracked natural gas and fossil fuels are not a long-term solution to climate change, we should also be able to agree that taking strong steps to reduce the dirtiest sources of pollution should be a top priority. The methanol plant at Kalama does exactly that. In a big way. https://i2.wp.com/moreperfect.org/site/wp-content/uploads/2018/11/like_trump.jpg?fit=800%2C533 533 800 Timothy http://moreperfect.org/site/wp-content/uploads/2016/09/logo-300x138.png?_t=1475293815 Timothy2018-11-30 08:58:112018-12-10 11:31:54What Do Donald Trump, The Sightline Institute, Sierra Club of Washington and Columbia River Keeper Have in Common?